Activated charcoal is a hot topic in health and wellness these days, gaining recognition as a powerhouse agent for detoxification with a wide range of potential uses. We see activated charcoal in everything from facial masks and teeth whiteners to digestive remedies and even an exotic new food trend that uses its charcoal hue for an element of surprise (think jet-black ice cream). Activated charcoal benefits are no secret. A staple in traditional Ayurvedic and Chinese medicine, activated charcoal remains to this day a common emergency room antidote for cases of toxicity and poisoning in developed nations around the world. As for activated charcoal uses in daily life, this natural healing product is extremely versatile and generally considered safe. Yet activated charcoal should be handled with care (scroll down for an overview of activated charcoal side effects). Activated charcoal is a byproduct of burning coconut shells, bamboo, olive pits, wood, or various other substances. For your natural medicine cabinet, we recommend purchasing activated charcoal that is organic and made from coconut shells. Processed at very high temperatures, this unique charcoal is “activated” in a way that changes its structure to increase the surface area and make it more porous. It is the porousness of activated charcoal that makes it effective at attaching to (“adsorbing”) toxins and flushing them out of the body. This is the principle behind activated charcoal detox. 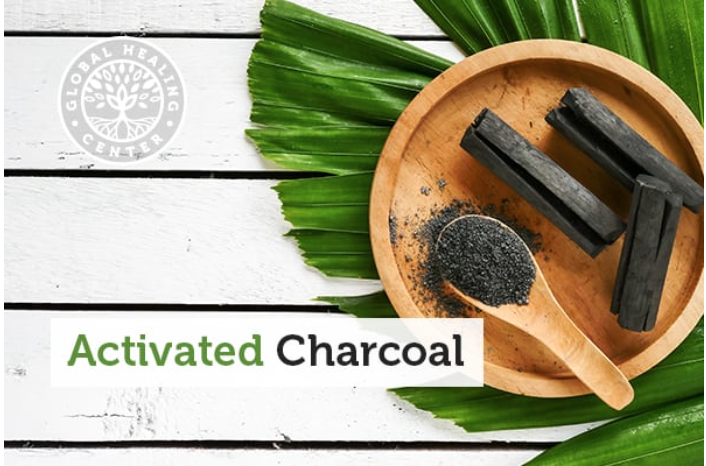 Unlike the charcoal briquettes you use to light your barbecue, activated charcoal is free of toxins and carcinogens and is generally safe to consume and apply topically. Never substitute regular charcoal for the activated charcoal used for health and wellness! With its purifying qualities, activated charcoal offers potential benefits including detoxification, alleviating gas and bloating, digestive health, lowering cholesterol, reducing the effects of radiation, and anti-aging. The most scientifically proven of all of activated charcoal’s benefits, detoxification happens naturally with this powerful agent. Because activated charcoal’s porous surface has a negative electrical charge, it attracts positively charged molecules such as toxins and gases for safe removal from the GI tract. In hospital emergency rooms throughout the developed world, a high single-use dosage of activated charcoal is the most frequently used method of gastrointestinal decontamination after certain kinds of poisoning, toxic exposure and drug overdose. Activated charcoal is considered to be effective for acute poisoning from a wide variety of drugs and poisons including acetaminophen, aspirin and tricyclic antidepressants. However, it is not useful for poisoning from lithium, iron, cyanide, potassium, and ethanol. While some use activated charcoal as a hangover cure, there is currently no evidence to support this. More than one study has shown that activated charcoal is not effective at adsorbing alcohol. Activated charcoal’s ability to reduce gas and bloating in the digestive system is scientifically proven. A double-blind clinical trial found reduced gas and bloating in subjects that used activated charcoal compared to the placebo group. And in 2011, the European Food Safety Authority presented its scientific opinion in favor of using activated charcoal to reduce excess gas in the digestive system. For more tips, see 10 Natural Remedies for Gas. When used for digestive cleansing, activated charcoal can promote overall digestive health. Considered a natural gut cleanser, activated charcoal can help lighten the body’s toxic load — potentially reducing allergic reactions and oxidative damage, as well as strengthening the immune system. Some researchers have found that activated charcoal can help people regulate their cholesterol. Just as it does with toxins, activated charcoal can attach to (adsorb) and flush out cholesterol in the intestine, preventing its absorption in the bloodstream. In a controlled study of people with high cholesterol, activated charcoal was effective at lowering total and LDL cholesterol levels. Piggybacking on its powers of detoxification, activated charcoal can also reduce the effects of radiation. Through the process of adsorption, activated charcoal attaches to radionuclides in the same way that it attaches to other toxins. See “13 Natural Remedies for Radiation Exposure” for more about activated charcoal’s ability to neutralize radiation, as well as the science behind it. Through its ability to rid the body of toxins, activated charcoal has the potential to be a natural approach to healthy aging. With a reduced toxic load, the body experiences less of the oxidative damage that drives the aging process. In the same way, it may help to prevent cellular damage to our natural detox organs (the kidneys and liver) and also support adrenal gland health. Activated charcoal use runs the gamut from gut-cleansing detox to purifying facials, teeth whitening, bug-bite care and more. Keep activated charcoal on hand for natural healing remedies like these. The digestive tract is where a myriad of toxins can enter our bodies, from pesticides and heavy metals in food, to chemicals in water and exposure to mold. When you eliminate toxins with a digestive cleanse, you can feel lighter, stronger, and more energetic. While there are many different kinds of digestive cleanses, a simple approach is to eat whole, organic foods and avoid sugar, caffeine, and alcohol. Activated charcoal can supercharge your cleanse by assisting with the removal of toxins through the process of adsorption — that is, the toxins attach to the activated charcoal like metal to a magnet, and then pass safely out of the body with a bowel movement. Recipe: To add activated charcoal to your cleanse, take 10 grams (either as a powder added to water or in pill form) 90 minutes before each meal for two days. Be sure to drink plenty of water to avoid constipation. An antidote to certain types of poisoning or exposure to toxic substances, drugs, or household chemicals, activated charcoal is handy to keep in your first aid kit or medicine cabinet. It is essential, however, to first contact 911 or a poison control center immediately. Depending on the type of poison, they may instruct you to administer activated charcoal at home before going to an emergency room. Note: Having activated charcoal in your first-aid kit or medicine cabinet can help jump-start the recovery process but should never replace a healthcare professional. In the same way that activated charcoal draws toxins out of the digestive system, when applied topically, it can draw oils, dirt, bacteria and other impurities from the pores, leaving skin clean, clear and less prone to breakouts. Recipe: Mix a teaspoon of activated charcoal powder with a tablespoon of honey to make a paste. Apply to face and neck with a cosmetic brush. Keep on for 5 to 10 minutes, then wash off with your favorite natural cleanser. Note that activated-charcoal powder is very messy when spilled! Avoid using it over hard-to-clean areas such as tile grout. Mixed with a bit of aloe vera gel, activated charcoal makes an effective acne spot treatment. Recipe: Break open one capsule of activated charcoal in a small bowl. Using a cotton swab, mix with a half-teaspoon of aloe vera gel to create a thick paste. Apply paste to acne. Let dry about 30 minutes. Wash off with warm water. It may seem counterintuitive to turn your teeth black in order to whiten them (don’t worry — the black washes off! ), but many people have success using activated charcoal as a natural teeth whitener. Because activated charcoal is abrasive to the teeth, dab it on gently rather than using a toothbrush. Recipe: In a small bowl, break open two capsules of activated charcoal. Using a cotton swab, mix in just enough water to make a thick paste (less than 1 teaspoon). Dab paste onto teeth, let sit three minutes and rinse. Activated charcoal’s ability to alleviate gas and bloating is clinically proven. If certain foods trigger gas, activated charcoal is one way to keep flatulence at bay. Tip: Take 1 gram of activated charcoal at least 30 minutes before you eat and 1 gram an hour after you eat. Activated charcoal can be a great remedy for mosquito bites and bee stings, as it can alleviate the itching and discomfort that they cause. Recipe: In a small bowl, break open one capsule of activated charcoal. Using a cotton swab, mix with ½ tablespoon of coconut oil and apply to the bug bite or bee sting. Just as it can remove impurities from the body, activated charcoal can also remove contaminants from water. Activated charcoal is a key component in many commercially available water filtration systems, and works in a similar way to the carbon filtration in the popular Brita water pitchers. Activated charcoal in water filters may be effective at removing pesticides, solvents, and other chemicals. However, it is less effective at removing fluoride, viruses, bacteria, and hard-water minerals. In the same spirit, activated carbon is also effective as a filter for air purification. Much like baking soda, commercially available charcoal bags can be placed in the refrigerator, car, pet areas, gym bags, and other places to freshen air, neutralize odors, and combat mold. Activated charcoal is available in pills, tablets, capsules, and loose powder for multipurpose use. In all forms, activated charcoal is odorless and neutral-tasting. Activated charcoal to reduce gas and bloating is often taken in pill or tablet form. Generally, two pills or tablets are recommended to be taken at least 30 minutes before eating gas-producing foods, and one hour after. Purchasing activated charcoal in capsule form is a handy way to use small amounts for recipes. Simply break open a capsule into a small bowl to release the powder, and mix it with water, coconut oil or another ingredient to make a paste for DIY healing. A jar of fine, jet-black activated charcoal powder is handy for a variety of uses. In cases of poisoning or the ingestion of toxins, activated charcoal powder is mixed with a liquid and given as a drink (or, in emergency rooms, administered through a tube from the mouth to the stomach). For more common household use, activated charcoal powder can be used in small amounts for teeth whitening and other remedies. Are There Side Effects to Using Activated Charcoal? It is important to remember that activated charcoal not only adsorbs to toxins and unwanted chemicals in the body but it can get rid of good things, too, such as nutrients from food, supplements, and prescription medicines, making them less effective. It is best to take activated charcoal on an empty stomach between meals so that it does not affect the absorption of nutrients. Activated charcoal should be taken 90 minutes to two hours prior to supplements and prescription medications. Keep in mind that activated charcoal can make your stool turn black, but this is a temporary and harmless side effect. In addition, be sure to drink plenty of water to prevent constipation when taking activated charcoal. Activated charcoal is generally considered safe for use during pregnancy. At least one study supports its use for cholestasis, which is a condition marked by the reduction or stoppage of bile flow, during pregnancy. Some pregnant women use it to alleviate symptoms of nausea and vomiting (morning sickness) as well as diarrhea, though its effectiveness in such cases is not well documented. In some people, activated charcoal can cause side effects of vomiting and diarrhea — the very symptoms it may be used to relieve. What about you? Have you ever used activated charcoal? What’s your favorite recipe? Tell us your story in the comments below. LoVecchio F, et al. “The feasibility of administration of activated charcoal with respect to current practice guidelines in emergency department patients.” Journal of Medical Toxicology. Sept. 2007. Juurlink DN. “Activated charcoal for acute overdose: a reappraisal.” British Journal of Clinical Pharmacology. Mar. 2016. Olson KR. “Activated Charcoal for Acute Poisoning: One Toxicologist’s Journey.” Journal of Medical Toxicology. 2010. Hultén BA, et al. “Does alcohol adsorb to activated charcoal?” Human Toxicology. May 1986. Jain NK, et al. “Efficacy of activated charcoal in reducing intestinal gas: a double-blind clinical trial.” The American Journal of Gastroenterology. Jul. 1986. “Scientific Opinion on the substantiation of health claims related to activated charcoal and reduction of excessive intestinal gas accumulation (ID 1938) and reduction of bloating (ID 1938) pursuant to Article 13(1) of Regulation (EC) No 1924/2006.” European Food Safety Authority Journal. 2011. Neuvonen PJ, et al. “Activated charcoal in the treatment of hypercholesterolaemia: dose-response relationships and comparison with cholestyramine.” European Journal of Clinical Pharmacology. 1989. Kaaja RJ, et al. “Treatment of cholestasis of pregnancy with peroral activated charcoal. A preliminary study.” Scandinavian Journal of Gastroenterology. Feb. 1994.